I do not fly very often. Consequently I have not become jaded about air travel. I still think it is astounding that we can soar — inside an extremely well-engineered tube of aluminum — into the sky and then gaze down upon planet earth. Every time I leave the ground in an airplane I experience a mixture of astonishment and bliss. How does this enormous chunk of metal rise higher and higher and higher until we are above the clouds? I know it has to do with the shape of the wings and different amounts of air pressure above and below them. Even with this explanation, I am still AMAZED that my plane leaves the ground. Bernoulli’s principle is also involved with speaking and singing — influencing how our vocal cords (which can be more accurately described as vocal folds or lips) are able to come together and apart thousands of times per second when we are making sound. Singing and flying are both about air flow! And — for me — they are both about joy. I wrote and recorded “I Love To Fly” before I ever thought about teaching Music Together. I started working on it when I was waiting in terminal E at Logan airport for a flight to visit friends in Toronto. A father was trotting back and forth with his young son happily bouncing on his shoulders while I was chanting the chorus onto my lap top using Garageband. You can hear them at the beginning of the song. With hindsight, “I Love To Fly” appears to be a lovely foreshadowing of my new life as a Music Together teacher. Leading Music Together classes is also about joy. Watching the expressions on children’s faces as they encounter new sounds, new rhythms, new voices, new instruments is often a joyful experience. I sometimes find myself laughing with delight during class — simply because the children are so present and engaged with what is happening in the room. In a Music Together class, our goals are exploration and experimentation, rather than perfection or performance. I love to fly. I love to sing. I love to dance. I love to lead Music Together classes. I love to perform at retirement communities. This past Sunday pianist Joe Reid and I performed an hour of songs with music by Harold Arlen at an independent living center in Quincy, MA. The residents who showed up were very friendly — and a few of them knew the words to almost every song! Even if they weren’t singing, I could see that everyone was moving some part of their body — fingers, toes, head, torso — in rhythm with the music. It was a delightful way to spend an hour of my life. Afterwards one woman — whose eyes had been closed for much of the time — explained that when these songs had been popular, she and her husband had not had a lot of money, but that they HAD been able to listen to music on the radio. So even though it may have appeared she was dozing off, she had in fact been remembering that time in her life and imagining that her husband was still sitting next to her. The previous day pianist Doug Hammer and I had performed a 40 minute chunk of my show, “The Kid Inside,” at a benefit for a new organization called OUT MetroWest. OUT MetroWest has been providing supportive space for LGBTQ teenagers to meet for many years, and this benefit was a big step to expand their services beyond the Unitarian Universalist church in Wellesley where they began. I originally created “The Kid Inside” to perform for the 10th grade class at my high school. It’s a recollection, using stories and songs, of my high school years — including how conflicted and confused I felt about my sexuality. When he answered the door, I was unable to say anything and just stood there — feeling stuck and ashamed and humiliated. 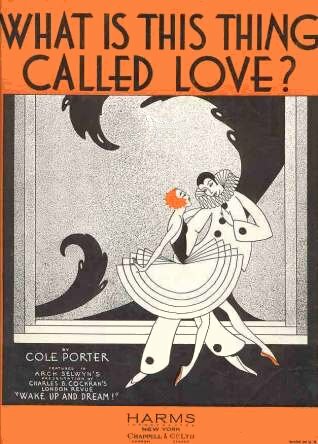 I follow this story by singing the Cole Porter song “What Is This Thing Called Love?” — which is in the player at the top of this post with Doug Hammer on piano, Mark Carlson on bass, and Kenny Wenzel on trombone. I am happy to know that there are now safe spaces at many high schools to talk about the amazing and powerful and at times perplexing topics of sexuality and identity and relationships — as well as organizations like OUT Metro West. And I am amazed at how songs can re-connect us with people and places from our past. How music taps into our memories and opens our hearts is a mystery. Today I embrace those mysteries and remain grateful for all the music in my life on a daily basis. Thank you for reading…and listening.